at 1520 Caswell Street in Raleigh, North Carolina. The York Rite is one of the appendant bodies of Freemasonry in which a Master Mason may proceed to supplement and amplify the Blue Lodge degrees, affording historical background on the work and meaning of Freemasonry. 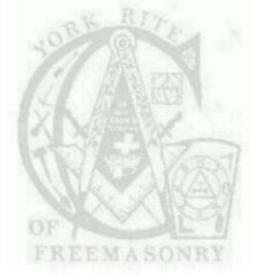 The York Rite takes its name from the old English city of York. The York Rite is not a religion in itself, it does, however, develop themes based on the Medieval Crusades. The York Rite confers degrees beyond the Blue Lodge's three degrees. In the York Rite, A Master Mason may become a member of three bodies that consists of nine additional degrees: Chapter - Mark Master, Past Master, Most Excellent Master, and Royal Arch Mason; Cryptic - Royal Master, Select Master, and Super Excellent Master; Chivalric Orders - Illustrious Order of the Red Cross, Order of Malta and the Order of the Temple. . In none of these is any memorization required to advance from one degree to another. There are many easily learned parts that any interested Mason may acquire and participate in the conferring of the work. In the York Rite, most of the work is by a cast of characters made up to portray more vividly the message and the cast is robed to add to the impressiveness of the lessons. Many believe the Sublime Degree of Master Mason to be the ultimate degree of Freemasonry and that all others are added and explanatory. Most students of Freemasonry agree that the story of the Craft as presented in the three degrees is incomplete and that the degrees offered in the York Rite of Freemasonry complete the story and answer many of the questions in the mind of the newly made Master Mason. Any questions or concerns about this webpage or any of its contents please contact the Webmaster of this site. To the webmasters knowledge there is no copyright infringements on any of the images in this site. Please feel free to use what you can. The Webmaster is a Freemason and Sir Knight and believes strongly in its purposes. Peace be with you all. This is site is intended to further ones study in freemasonry.